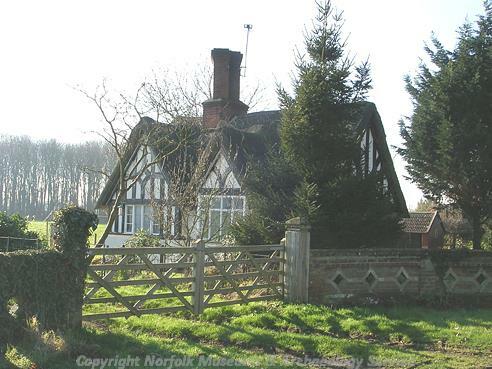 Carleton St Peter is a very small parish nestled on the banks of the River Yare, east of Ashby St Mary and northwest of Loddon. The village has now shrunk to two farmhouses – Lower Farm and Hall Farm, and the church is now some distance from this main concentration of settlement. The village name is Scandinavian in origin and has been translated as ‘enclosure of the free peasants’. Carleton is a common name in areas of the old Danelaw. 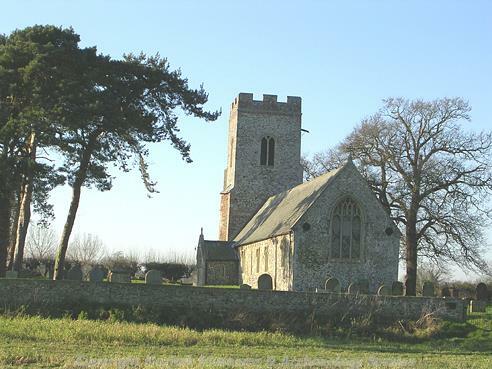 The St Peter part of the name refers to the church and is used to differentiate the village from Carleton Rode and Carlton Colville in Suffolk. The village is mentioned in the Domesday Book when Roger Bigot of the King’s Livery owned part of the parish. There are few archaeological records for this parish, but this probably reflects the lack of modern settlement and archaeological research in the area rather than a lack of human activity or occupation in the past. The earliest evidence for activity in the area is from the prehistoric period. This is mostly concentrated close to the marshland. Worked prehistoric flints (NHER 33758 and NHER 35090) have been found and cropmarks that can be seen on aerial photographs may be prehistoric field systems (NHER 17290 and NHER 19520). To the east of the parish part of a large prehistoric site (NHER 17291) adjoins the field system and Bronze Age ring ditches and a possible Neolithic to Bronze Age henge monument have been identified. Another Bronze Age ring ditch (NHER 19520) has been identified nearer the church. The parish was an area where people were living, setting out field systems and building monuments adjacent to the marsh. The marsh would not have been drained in the prehistoric period and would have provided important resources such as ducks, herons, fish and reeds to the people living here. 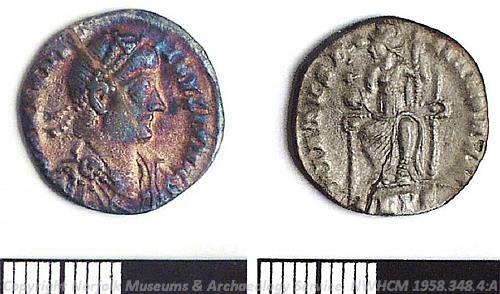 In the Roman period two 4th century Roman coin hoards (NHER 10319 and 35090) were buried here. These were further away from the marsh on slightly higher ground than the prehistoric sites. Roman pottery (NHER 33757) has also been found on this higher ground, while a group of rectlinear enclosures between the findspots of the coin hoards and within an extensive coaxial field system may represent the possible site of a farmstead or villa (NHER 49533). An Early Saxon urn (NHER 19520) found to the east of the church may date the rectangular enclosure and trackways (NHER 19520) noticed at the same site. These might represent the original settlement of Carleton St Peter near the church. Medieval finds are also concentrated around St Peter’s church (NHER 10336) that is probably Norman in date although has been significantly changed in the medieval and post medieval period. Medieval building stone (NHER 31940) was found nearby and a medieval pendant (NHER 29424) was found to the south by metal detecting. These might all be representative of settlement around the church. In the medieval period the marsh was still used as a resource and peat cutting (NHER 13525) was carried out here at Carleton Broad that is now overgrown. In the south of the parish Langley Park (NHER 30467) was originally a medieval deer park. It was landscaped into formal gardens and parkland in the post medieval period. The post medieval settlement seems to move slightly to the north, as the foundations of and building material from post medieval buildings (NHER 31534 and NHER 31548) have been found in ploughing on fields adjacent to Ferry Road close to 17th century Hall Farmhouse (NHER 35367). Since this period there seems to have been a decrease in settlement size to the two farmhouses still occupied. http://www.stevebulman.f9.co.uk/churches/images/norf/carleton.jpg. Accessed 15 February 2006.
http://www.norfolkchurches.co.uk/carletonstpeter/carletonstpeter.htm. Accessed 15 February 2006.